In the Sertshang Orphanage Home in Kathmandu between 50 and 60 children and adolescents of different ethnicities live together. 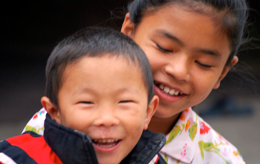 Here they have found not only a loving and safe home, but they also receive a good education. The majority of them are orphans and, before they came to the orphanage, their lives were often marked by hunger, violence and neglect. Only very few of them had been to school. The children are accommodated in two houses: the girls’ house and the boys' house. The home, which has a garden and a sports field, is situated in Kimdol, a quiet district of Swoyambunath on the outskirts of Kathmandu. The children’s home is managed by a Tibetan lady, Methok Lama. She escaped from Tibet with her three younger sisters at the age of 14, and came to Sertshang Orphanage Home after spending several years in a refugee camp in India. She knows from her own experience how children feel without a family, and how valuable a safe home is. Methok is not only the manager, but also a mother and sister for the children and young people in the home. The small team includes the cook Radhika Karki, as well as a household help. They all live like one large family, which gives the children a great feeling of security. Very early on they learn to take responsibility for themselves and the community. The older children take care of the little ones, and they all help with the housework. The orphanage is recognized by the Nepalese state, and is financed entirely by private donations. Brigitta Niederhauser, Founder and Chairwoman of Sertshang Orphanage Home Switzerland, died unexpectedly this summer. We miss her goodness of heart. Losing our Brigitta Mom is a devastating feeling. Our eyes are swelling up with the magnitude of emotions because we lost our mother. She was more than a mother, she was everything for us. She had supported us from the time when we were nothing. She helped us make our lives better in every way. Her caring and loving nature never let us feel that we are orphans. Every year we waited for her return and spent time with her. The time our family lived with our dear mom will forever stay with us as a beautiful memory and encourage us to move forward with a smile. We all know that her love and support will always be with us. She will always be in our heart as a loving mother. Sertshang family will always be thankful for her selfless unconditional love. She was such a pure and great human being. Brigitta Mom‘s memory will always be the guiding force in our life. We are all devastated and praying for her soul every day.